The Mexican long-tongued bat is one of the species that pollinates agave, but its ecosystem is being disrupted by large-scale, cheaper methods of making tequila. You can't have tequila without agave, the spiky desert plant used as its base. And it's hard to have agave without bats — because a few species of these winged creatures are the plant's primary pollinators. Agave co-evolved with bats over thousands of years. As a result, it's one of the very few plants that pollinates at night. Daulton says industrial agave farming adversely affects both plants and bats. "The tequila industry has seen a 60 percent growth over the past 10 years," he says. "At the super-premium level, where you're spending $30 a bottle or more, it's more like 400 percent growth. And that means you have to grow a lot of agave." The problem, adds Micaela Jemison, also of Bat Conservation International, is that commercial production involves cutting agave stalks before they reproduce. That means no tasty pollen for hungry bats. And instead of plants that reproduce through bats spreading pollen from stem to stem, major tequila companies use cloned agave. "They are not naturally pollinated," Jemison says. Growing genetically identical plants is easy and cheap for big companies, but cloned agave is vulnerable to fungus or disease that could wipe out entire crops. Bats can solve this problem by creating genetic diversity. Instead, their ecosystem has been disrupted. Fewer agave plants are allowed to flower and growers use powerful agrochemicals that can hurt the three kind of bats that feed on agave. Two of these bats are listed as endangered by the U.S. Fish and Wildlife Service: the Mexican long-nosed bat and the lesser long-nosed bat. The third, the Mexican long-tongued bat, is listed as a species of concern. Jemison says these bats need stretchy, Gene Simmons-esque tongues while they hover over fertile agave stems stuffed with pollen. "[They] use their long tongues to actually dig into the flower and get out that really awesome nectar for them to eat," she says. "So they literally get their heads covered in this pollen. And as they're going from agave plant to agave plant, they're pollinating them at the same time." This happy hour is the perfect place to overhear enthusiastic cocktail chatter about bats. Bats have belly buttons. They're the second largest group of mammals in the world. The tube-lipped nectar bat has the longest tongue of any animal relative to its size in the world. Restaurateur Joaquin Meza says as a boy growing up in Mexico, he was afraid of bats. "You know, I saw a bat and I wanted to run away," he says. "Now I understand the work they do. Like bees." Meza is part of the Tequila Interchange Project, a coalition of bartenders, scientists, industry consultants and plain old tequila lovers who want to make producing it more sustainable. 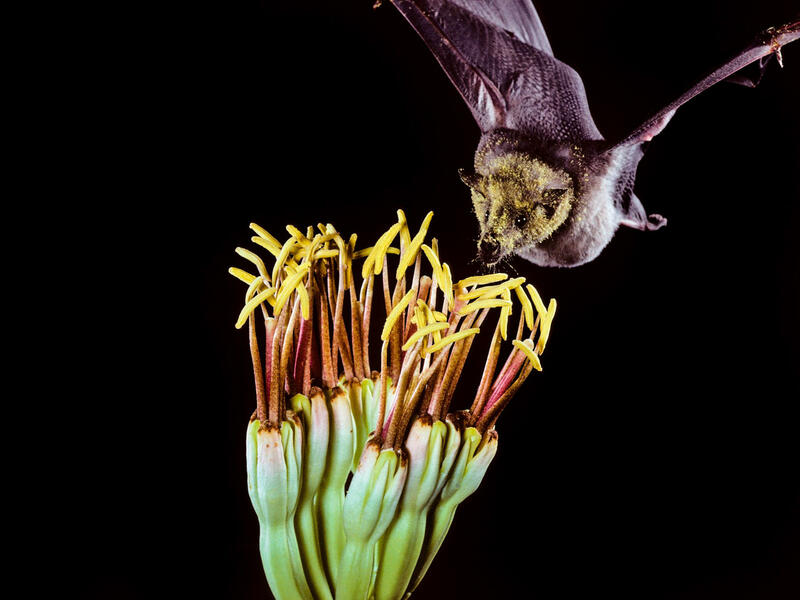 As part of its mission, the group promotes bat-friendly brands of tequila and mescal that allow a portion of agave plants in their farms to flower — and feed the flying creatures who come trick-or-treating for their pollen after dark. Now this Halloween story about bats and spirits - not spooky spirits. We're talking tequila. NPR's Neda Ulaby went to a Mexican bar in Washington, D.C., to research the connection between bats and booze. NEDA ULABY, BYLINE: It's a Halloween happy hour hosted by the head of a group called Bat Conservation International. MIKE DAULTON: And we're here at a bar tonight to talk about them because they are intimately tied to agave. ULABY: Agave, the spiky desert plant used to make mezcal, tequila and, by extension, the delicious looking margarita someone's offering me right now. UNIDENTIFIED WOMAN: There you go. ULABY: You can't have tequila without agave. And it's hard to have agave without bats, says Mike Daulton. He runs the Bat Conservation Group. And he says industrial agave farming affects both the plants and the bats that pollinate them. DAULTON: The tequila industry has seen 60 percent growth in the last 10 years. At the super-premium level, where you're spending $30 a bottle or more, it's more like 400 percent growth. And so that means you have to grow a lot of agave. ULABY: And the problem with that - well, let Micaela Jemison explain. She also works for Bat Conservation International. And she's adorned appropriately in bat-themed jewelry. JEMISON: Yeah. They're pretty much clones of each other. ULABY: Growing genetically identical plants is easy and cheap for a big tequila company, but they're vulnerable. Fungus or disease could wipe them all out. Bats are the answer. Jemison says three kinds of bats create genetic diversity in agave by mixing up their pollen. JEMISON: The Mexican long-nosed bat, the lesser long-nosed bat and the Mexican long-tongued bat. ULABY: Notice a bit of a theme? There's a kind of pollinating bat that has a tongue longer than its body. JEMISON: You think how would it fit in its mouth? JEMISON: It actually has to roll its tongue up in the back of its throat to fit it all in. ULABY: Consider that when planning your next Halloween costume. Jemison says these bats need Gene Simmons-esque (ph) tongues when they hover over fertile agave stems stuffed with pollen. JEMISON: And use their long tongues to actually dig into the flower and get out that really awesome nectar for them to eat. So they actually literally get their heads covered in this pollen. And as they're going from agave plant to agave plant, they're pollinating them at the same time. JOAQUIN MEZA: Evil, scary creatures. You know, I saw a bat, and I wanted to run away. And now it's - I understand the work they do like bees. ULABY: Now Meza wants to convince tequila producers to create bat-friendly labels, putting, if you will, a little boo back in booze. Neda Ulaby, NPR News.